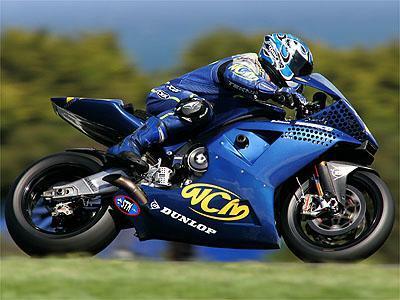 British rider James Ellison will ride for the WCM team in the 2005 MotoGP series after some impressive performances as a replacement rider in 2004. Ellison scored points for the team on his second appearance in 2004 on the current Harris V4 bike. WCM announced its partnership with Blata in August with details of the liquid-cooled, V6 990cc four-stroke, claiming a 220+bhp output and a top speed of over 320km/h.